If your holiday season looks anything like ours, there are parties, lots of meals shared with family and friends, a handful of flights, cold temperatures, and dark evenings. Even if you have a great workout routine the rest of the year, it can be a struggle to maintain the good habit over the holidays and throughout the winter. And if you’re like many of us, it’s often a struggle in the first place to fit in a workout with the competing demands of kids, work, and life in general. First of all, know that it’s OK if you don’t make it to the gym for regularly scheduled workouts. We all have a finite amount of energy and time, and something has to give when the calendar is overloaded. That said, it often feels good to move your muscles after being cooped up. In addition, you’ll benefit from all the mental-health and brain-health benefits of exercise. If you’re looking to stay active over the holidays, here are a few ideas to make your routine fun and stress-free. 1) Try A Fun New Workout. If you have something like ClassPass in your city, grab a free week and check out some of the gyms in your neighborhood. Many gyms also offer a first class for free, so don’t be afraid to ask. Indoor surfing, aerial yoga, boxing, or a dance class can break the monotony and make you excited to lace up your shoes. If you don’t have gym options, don’t forget that all movement is good for you! How about ice skating, snowshoeing, pulling your kids on a sled, or a snowball fight in the backyard? Most people feel that if they can’t sweat hard for an hour, it isn’t worth doing anything at all. But something is always better than nothing. Set a timer for five or 10 minutes and pick three to five movements you are comfortable with. Repeat the rounds until your timer goes off. Basics like squats, push-ups, jumping jacks and lunges can make a great workout. Just do something. 3) Create A New Walking Tradition. When the weather gets colder, most people hunker down inside. But I invite you to rethink how you interact with the outdoors in winter. 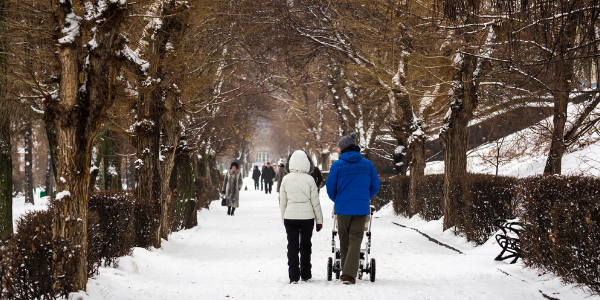 As long as you have a warm jacket, hat, and gloves, you should be able to at least take a quick walk around the block to get your blood flowing. If you live in a place where it gets icy or has significant snow, consider getting snow-traction devices for your boots so you don’t slip. 4) Try Streaming A Workout. We live in the age of the internet, which means that you are just a click away from the entire world! There are many options to stream workout videos directly to your computer or phone. There are plenty of free options on YouTube, as well as paid memberships through places like ClassPass, DailyBurn, and YogaGlo. Sometimes having someone guide your workout is all the motivation you need to get moving! Finding an accountability partner is one of the best ways to stick to a routine. Knowing that someone is there waiting for you will give you the extra boost to get out the door. An added bonus is spending more time with people you care about! Whether it is a weekly walk, gym session, or a workout in your living room, a friend can make the experience much more enjoyable. 6) Pair It With Something You Love. This is called habit bundling. Attach something that you need to do to something that you want to do. I make some seriously delicious smoothies and look forward to them after a hard workout. It makes the process of working out a bit easier, because I know I can enjoy a tasty smoothie once I’m done. If you want to schedule a regular walk, listen to your favorite podcast or talk with a friend on the phone to make walking an event you look forward to. Or download your favorite TV shows and watch them as you ride a stationary bike at the gym. You may not enjoy working out, but knowing that something you love is part of the deal makes it a whole lot more pleasant. How do you stay active during the winter months? Do you have a favorite workout that keeps you warm, despite the cold? Whitney is a personal trainer in Denver, Colorado and loves getting lost in the mountains as much as she loves lifting a barbell. When she isn’t playing dinosaurs with her four-year-old, she is in the gardening or has her nose in a book.